These ten years have been a period of rapid growth in Westampton Township. Two major residential developments, Tarnsfield in the eastern part of the Township and Rolling Hills in the western part have added approximately a thousand new homes to our community which has more than doubled the population. Significant commercial development has occurred on Route 541 and other new construction includes a firehouse and a large professional building on Woodlane Road, a Special Services School at the Burlington County Complex on Woodlane Road, the Farm Credit Service Bldg., the United Way Headquarters and the Burlington County Boy Scout Headquarters all on Rancocas Road. Several existing buildings have been expanded, including Inductotherm, Westampton Township Municipal Bldg., and the two Township schools, Holly Hills and Westampton. In August of 1976, leaders of Rancocas Fire Co. # 1, foreseeing the need for a second fire station, requested the Burlington County Freeholders to make ground available at the County Complex on Woodlane Road. This request was never granted and over the next several years, several other possible locations were investigated. Ultimately, a fine new station was built in Tarnsfield by the newly-formed Westampton Township Fire Department and Emergency Unit. 1976 was the year that Westampton Township, along with the rest of the country, celebrated the National Bicentennial. Rancocas Fire Company Members, wearing colonial costumes designed and made by volunteers led by Mrs. Bets Lucas, wife of Chief Dale Lucas, were the stars in a grand parade and ceremony held at the Municipal Complex on Rancocas-Mt. Holly Road. The Firehouse improvement projects included: repointing the exterior brickwork, brick veneering the exterior walls of the kitchen addition, installation of ceiling lights and fans for the upstairs restrooms, paneling and improvement of the stairway, new carpeting and the construction of a parking area on the west side of the firehouse (the ground was rented from the Rancocas Society of Friends for one dollar). New members included many female fire fighters, and several have become some of the most active members of the Company. The first female member joined in October, 1975. In May, 1976, the Fire Company responded to 31 fire alarms, including 7 on May 10th. Raise $1,213 for Carl Poole, one of Rancocas’ Special Persons. Defeat Westampton Courts in a softball game 19-8 (obviously a pitcher’s duel). Repair a serious leak in the roof near the chimney. Participate, in colonial uniforms, in the Bicentennial celebration. Serve two fund-raising Ham Dinners. Send receipts of a 50-50 drawing to Holly Beach Fire Co. to help defray costs of a heart transplant for a fellow fireman. One of the town’s favorite people and most active firemen, Gordon Lucas, was transferred to California in 1976. 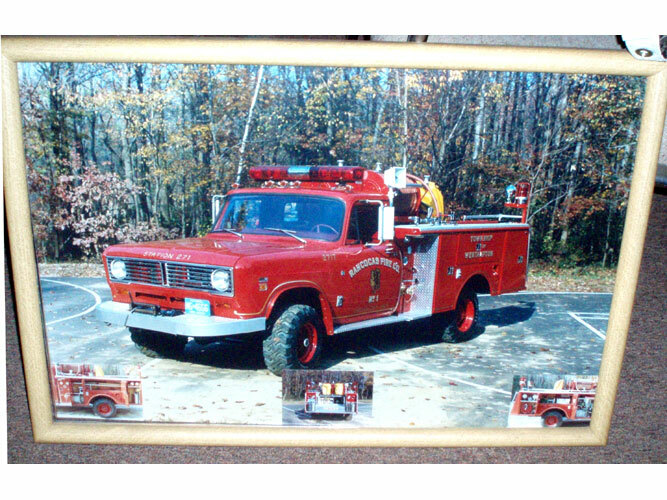 During 1977, a new Class A pumper was put into service and the 1952 Chevrolet tank truck was sold to the highest bidder, Nat Alexander Co. for $775. Another truck, the 1932 Chevrolet, long since retired, was located on a farm in Vermont by Chief Engineer Ralph Bensel while traveling in the area. The Burlington County Communication Center went on 24-hour service in August, 1977 to provide state of the art emergency communications for fire departments, emergency squads and police. After the “bugs were worked out,” the new systems proved to be a tremendous asset to the Emergency Services. Long-time members will recall when members of the Miller family ran to the Firehouse at all hours of the day or night to sound the siren after receiving a phone call reporting a fire. The Spring and Fall Ham Dinners, organized as usual by Carrie Brown, were again successful fund raisers, making a total of $3,000 for Fire Company equipment. New members included several from the “newer” areas of the township. One of the worst fires in Westampton Township occurred in February, 1978 in the early morning hours during one of the worst snowstorms in several years. The Villa Roma restaurant burned to the ground despite efforts of Rancocas Fire Co. #1 and other area fire companies. The problem went from bad to worse when a county snow plow sheared off the fire hydrant nearest the fire while clearing the snow to find the hydrant. This year (1978) Carrie Brown and her “Baked Ham Dinner Crew” raised $3,028 with the two Ham Dinners. 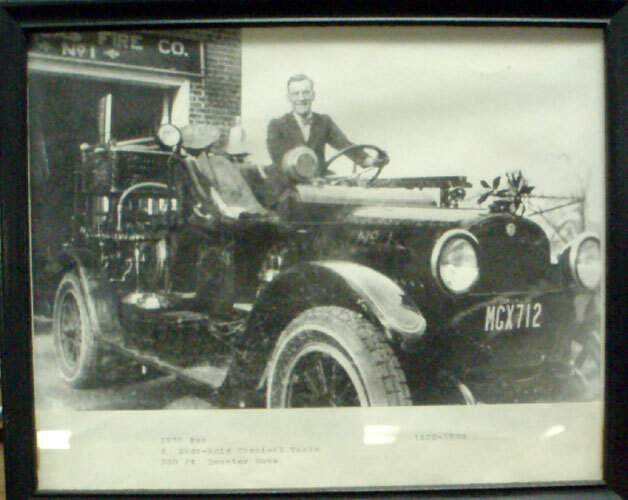 “Travelling” Ralph Bensel located the 1946 Ford in Gordon County, GA. Rancocas Fire Company had sold it to the County in 1966 for $800. 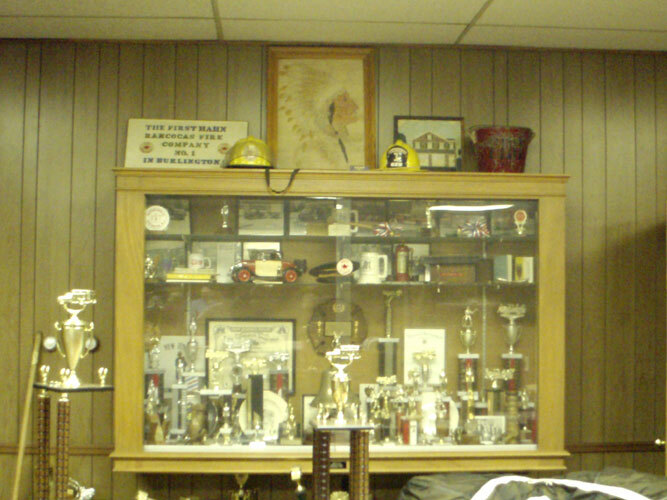 1978 saw the formation of a second fire company in the Township. On August 29, 1978, Westampton Township Fire Department and Emergency Unit (WTFD & EU) was officially organized. After a few bitter misunderstandings and some persistent differing opinions, the two companies were soon working side-by-side to protect lives and property in the best traditions of the fire service. During 1979, Charter Members: Herbert Bensel, Watson Buck, Edward Friend and William Stemmer were honored and presented with a plaque of appreciation for 54 years of dedicated service to Rancocas Fire Co. # 1 and to Westampton Township. In spite of the adage, “Everyone is created equal,” the Company had to place a special order to buy two pair of boots; one pair small enough to fit Diane Davis and another pair long enough to fit Joey Brown, Jr. Those for Joey Brown must have been OK; he is presently (1985) Third Assistant Chief. The Company responded to 209 fire alarms in 1979, including assisting at Rancocas Valley Hospital during a power failure and a house fire in Tarnsfield that delayed the start of the October meeting until 10:15 p.m. In 1980, as a result of many hours, much effort and follow-up, several members led by Ernie B. Rodgers, Jr. produced and presented to the Fire Company a comprehensive “Run Book.” This provided necessary preplanning information allowing faster, more accurate response to emergencies in Westampton Township. Two of the most serious fires in 1980 were at Inductotherm on Indel Avenue and Wetherills’ Lumber Company in Edgewater Park. On March 22, 1980, a testimonial dinner was held at the Firehouse for Carrie Y. Brown. Friends from the town, the Township, and throughout Burlington County came to show their appreciation and love for this wonderful lady who never said no to anyone who needed help and has been such an inspiration to so many people. In May, 1980, the Company celebrated the 55th Anniversary of its organization. With WTFD now having several pumpers in use, two pumpers no longer needed by Rancocas Fire Company were sold. Chief Engineer Ralph Bensel photographed them prior to their delivery to Philadelphia for shipment to Columbia, South America. In August, 1980, a new Chevrolet Utility van was placed in service. This provided the Township fire companies with a rolling supply station for rescue equipment, cascade equipment for refilling vital “Air-Paks,” Fire Police equipment, ventilation fans, salvage equipment and other special equipment. The 1916 American La France truck presently (1980) owned by Merchantville Fire Company has been identified as the same truck loaned to Rancocas Fire Co. #1 by Lumberton Fire Co. in 1931 when the Reo Chemical truck was destroyed in a severe accident at Centerton Bridge. The pay phones at Burlington County Votech School on Woodlane Road were removed after investigations traced to those phones 19 bomb threat calls that the Fire Company responded to. In December, 1980, a letter was received from the North Pole, signed by a Mr. S. Clause, asking the Fire Company to provide a truck late in December to transport him and a large bag to Westampton Courts, Sunnyside Farms, Burlington County Trust, Co., Rancocas Methodist Church, Holly Tree Court, Maple Tree Court and Rancocas Firehouse. Of course, the transportation was arranged! Members of Rancocas Emergency Squad, many of whom are active members of the Fire Co., housed their new 1981 Ford Ambulance on August 21, 1982. At the December 1982 meeting, Dr. John Sherry and Roger Winner spoke on the $2.1 million school improvement bond. Ex-Chief, Craig Johnson, a favorite with many of the younger members, was transferred to New York State in May, 1983. In 1983 and 1984, the Firehouse was the scene of an unusual sale to auction off approximately 20,000 books from the estate of Watson Buck. Rancocas Fire Co. #1 was proud to participate in the Dedication Ceremony of the Municipal Complex on Rancocas Road in 1983. 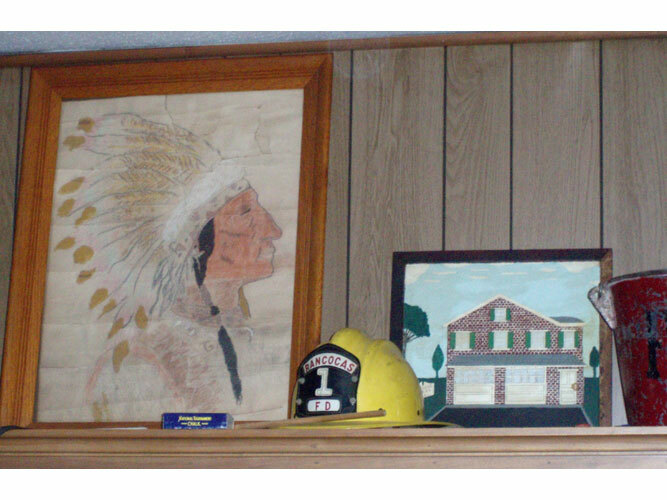 On February 13, 1984, the Rancocas Fire Co. # 1 Ladies Auxiliary was re-organized. At a meeting held at Rancocas Firehouse, the following officers were elected: President: Joann Bensel; Vice- President: Allie Stanford; Recording Secretary: Carol Andrews; Financial Secretary: Ruth Mohn; Treasurer: Julia Skwara; Honorary Member: Florence Irwin. Also present at the meeting were: Minnie Winter, Mildred Baker, Mary Walton, Shirley Bensel, Brenda Bensel and Miriam Evans. The membership has grown to 25 and in 1985, they provided new curtains for the dining room. On June 30, 1984, the Fire Company participated in the Dedication and Housing Ceremony at the headquarters of the Westampton Township Fire Department and Emergency Unit. The ceremony celebrated the dedication of the new firehouse and official housing of their equipment, the result of years of hard work and personal sacrifice by a group of highly motivated men and women. In March, 1985, Fire Company Life Members Louis C. Bensel and James Mohn received 25 year Active Membership Certificates from the Burlington County Chiefs Association. As we end another ten years since the organization of Rancocas Fire Co. #1, we miss our fellow firefighters who are no longer here. Some of our comrades who have answered their last alarm since our 50th Anniversary are: Herbert Bensel, Carrie Brown, Watson Buck, Keith Bowker, Ed Friend, Frank Kleinschmidt, Raymond Miller, Russell Pettit, William Stemmer, Fred Poole, Robert Wilkins. On this 18th day of May, 1985, we look forward to continued service and good will for our community.